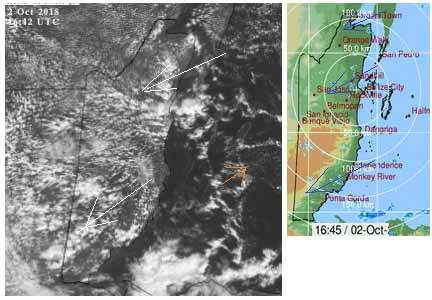 Belize NMS: A relatively moist northeasterly air flow prevails. 24-hour forecast: Sunny with cloudy spells today and cloudy at times tonight. A few showers and isolated thunderstorms will affect the coast and south this morning and then northern and inland areas this afternoon. General Outlook: For Wednesday and Wednesday night is for a similar trend to prevail. Upper level troughing extends over much of the NW Caribbean Sea. 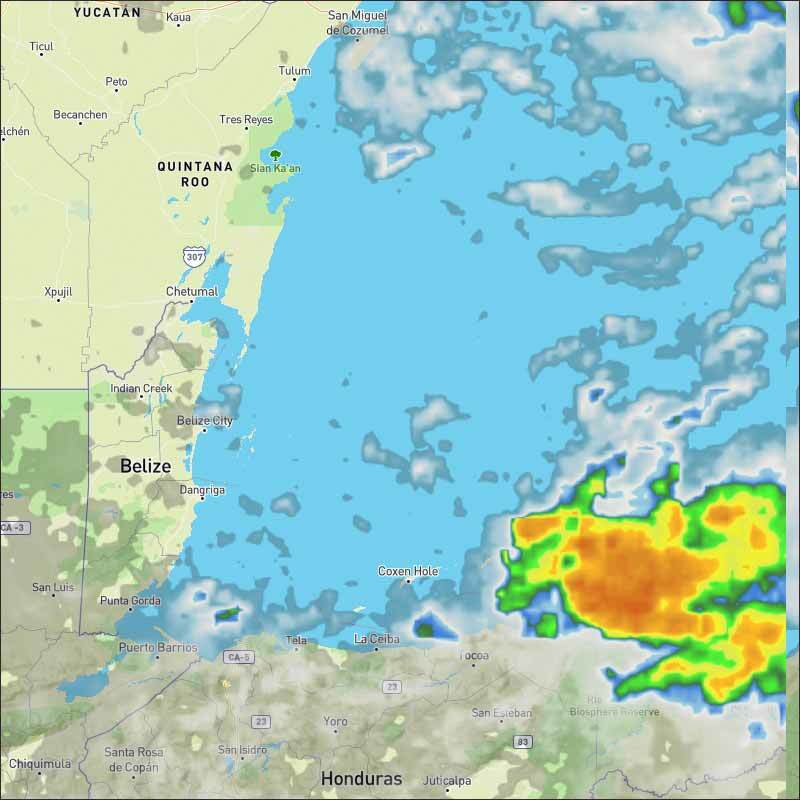 Scattered showers are in the Yucatan Channel. Broad upper level ridging is over the central and eastern Caribbean with westerly upper level flow, leading to fair weather east of 70W. A surface trough is nearly stationary along 77W. Scattered moderate to strong convection is seen from 12N-17N between 74W- 79W. The trough will drift slowly into the western Caribbean over the next several days. A large cyclonic gyre is expected to develop over this area by Friday. Large NNE swell generated from Leslie will pass through Atlantic passages into the Caribbean. 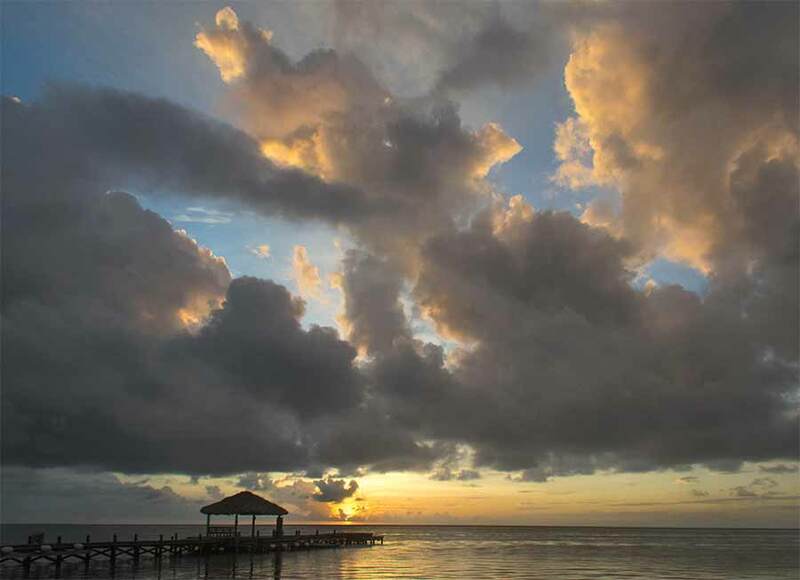 On Ambergris Caye this morning we have scattered showers and a flat calm sea around our barrier reef. The expected high temperature is 87 f.
In the early morning, I have often been seeing large areas of fog or more correctly low flying cloud, which is fog just up a bit and clear of the ground. This is what we have presently over much of central Belize and parts of the north, usually large areas of Guatamala are covered in the early morning, this will lift or burn off as the sun rises and the day warms. 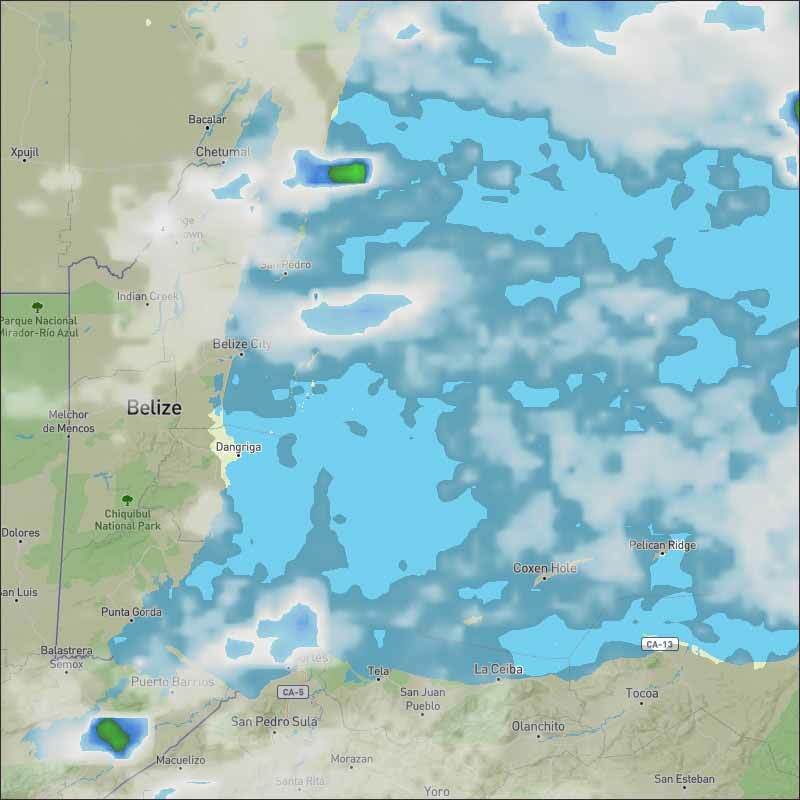 There is a large area of ITCZ activity in the central Caribbean area, this is a combination of the moist air left over from Kirk and the high level cloud that has been streaming over from the SW for several days, this could result in some wet weather for us later this week. Presently, there is chunky Caribbean clouds from the east, presently out at sea, but will be coming in later. Looks like today will be another mixed day, cloud patches, sunshine and always the chance of a rain shower.